Today, the Supreme Court issued a decision on the Muslim Ban (‘Muslim Ban 3.0’) that allows the Ban to take full effect. 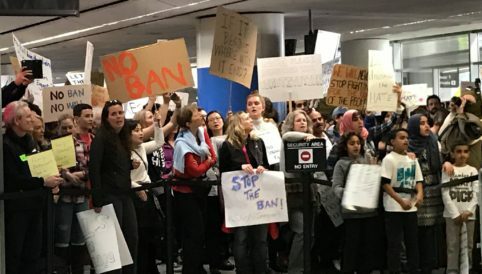 This is the first time a court has allowed the Muslim Ban’s implementation in its entirety. Today’s development has raised numerous concerns and questions, which have been addressed below. This information is subject to change based on the various legal challenges that may be advanced in court. The interpretations below can change quickly and will be updated should that happen. Certain nationals of eight countries – Chad, Iran, Libya, North Korea, Somalia, Syria, Venezuela, and Yemen. Please see below for a list of how certain nationals from each country will be impacted. Chad, Libya, and Yemen: All immigrant visas and nonimmigrant business (B-1), tourist (B-2), and business/tourist (B-1/B-2) visas are suspended from entering the U.S.
Iran: Immigrant and nonimmigrant entry will be suspended for Iranian nationals except for individuals with a student visa (F Visa), exchange program visa (J Visa) or vocational visa (M Visa). Individuals with an F, J, or M visas will be subject to enhanced screening. Somalia: Immigrant visas are suspended for Somali nationals. Non-immigrant visas are permitted but will be subjected to heightened screening. Syria and North Korea: All immigrant and nonimmigrant entry into the U.S. is suspended. Venezuela: Government officials and immediate family members of individuals involved in Venezuela’s screening and vetting procedures cannot enter on non-immigrants business (B-1), tourist (B-2) and business/tourist (B-1/B-2) visas. Nationals of Venezuela who are visa holders are subject to additional measures. Note: An immigrant visa allows foreign nationals to come to the U.S. to get a green card and reside in the U.S. permanently. A non-immigrant visa is a temporary visa issued to a foreign national for a particular purpose such as tourism, business, or study. Contact CAIR-LA’s legal number at 714-776-1177 if you or someone you know is impacted by the latest version of the Muslim Ban. If you have an urgent issue with a family member arriving within the next 24 hours at LAX and are calling after hours then call 714-801-0303. You can click here to register your travel with CAIR-LA. To request a “Know Your Rights” presentation you can click here.